Who National rules for are the rich, in all their diversity. And that has been one secret to their success. They are not attempting structural transformations of New Zealand capitalism, as Ruth Richardson attempted in the 1990s or Roger Douglas before her. Instead, they are ruling for New Zealand capitalists; trundling along without much in the way of strategy, avoiding full-frontal confrontations with the organised working class, making do with a mixture of cronyism, the lift of exports to China’s growing economy, rebuilds and dairy. This gives Key the economic and political base to promote his sort of anti-politics. He campaigns as a dull, decent figure, a kind of competent, likeable and popular manager. That, by and large, has succeeded. During Victoria University’s O Week this year Key was mobbed by students … trying to get selfies with the Prime Minister. Record-level non-participation these last two elections is the other aspect to this situation. Here again we have to register a defeat. A concerted trade union campaign to increase voter participation made little difference, with the turnout rate only slightly higher than last election and perhaps, if we take the figures around enrolment as our measure, less still. Keeping people out of politics is of course, as Dirty Politics revealed, an effective strategy for the Right. It succeeded this year. It’s clear that a significant section of the population – amongst the poor and the young most particularly – are disengaged almost entirely from political life. This goes some way towards explaining how we can have both a still-popular Key and clear signs of a social crisis, from child poverty and inequality to personal despair at the situation with WINZ. This is not a comforting account for our side. But its reality matters as a starting place for all of us who want workers’ power. National won this election. Labour’s result is its worst since the 1920s. Labour received fewer party votes than National in a host of its safe seats: Trevor Mallard, Grant Robertson, Phil Goff, Claire Curran, David Shearer and even David Cunliffe himself all ‘won’ in seats where Labour lost out to National. After a lacklustre and unenthusiastic campaign tailing National’s anti-political stance (what does “Vote Positive” even mean?) Labour puttered into nowhere. This is bad news for us all. We in the ISO have long argued that Labour is no political vehicle for the working class. But what happens inside Labour matters. It still commands the support of much of the organised blue-collar and industrial working class. Significant unions are affiliated to Labour. Labour’s direction and trajectory shapes politics in the unions. So Labour’s disintegration will have an impact on working-class politics more generally. Two lessons stand out. One is that the Maori and Pasifika industrial working class continue to be Labour’s staunchest and most solid bloc of support. Labour topped the poll for party votes in all of the Maori seats, getting more than double its nearest rival’s votes in every seat but Te Tai Tokerau. In Mangere Labour won more than four times National’s party vote. In Manukau East they won three times National’s score. In the Mana electorate National won out to Labour in the party vote; the polling booths in Cannons Creek, however, recorded ten times more votes for Labour than for National. Political commentators – and the National party itself – have, for years now, tried to talk up a split between Labour’s Maori and Pacific Island supporters and socially liberal or progressive policies. The election shows this up again as a wish rather than a reality. TV3’s Brooke Sabin trawled through the crowds at a union rally last year trying to find Pacific Island workers to fit his pre-existing story that unionists are homophobes. These results give the lie to that slander. National has made no real gains in South Auckland. And an orientation to the multicultural industrial working class remains the best way to promote all progressive change, on social issues as much as industrial ones. The other lesson is that this will not be what mainstream and respectable opinion chooses to stress. Already a fight is on to punish Cunliffe for his half-turn towards the left. Tracy Watkins in the Dominion Post demands ‘humility’ from Cunliffe; Matthew Hooton on election night was already using his slot on National Radio to complain about the unions’ influence in Labour. The parliamentary party – to the right of the membership – and the capitalist class will be fighting now to abandon those half-measures taken under Cunliffe and to push the party to the right. The number of experienced MPs who fought hard for electorate votes – and thus their own careers and salaries – but let the party vote slide shows just how unenthusiastic many in Labour’s parliamentary team were about the prospect of beating National in a properly political fight. 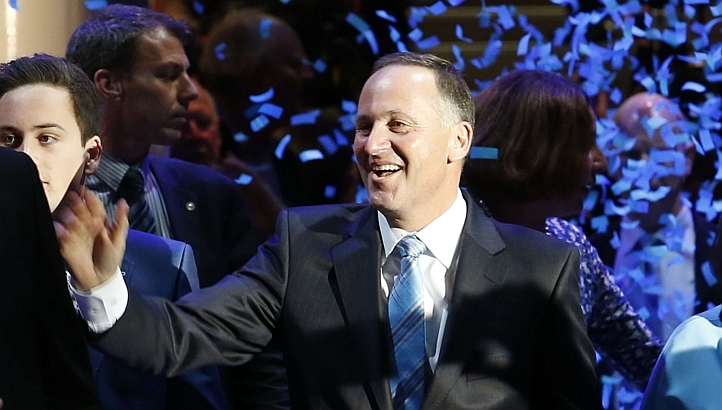 Did the party lose ‘middle New Zealand’? The ‘middle’ is a term that is meaningless without some contest. If National has succeeded in defining itself as the ‘middle’ then to talk about middle New Zealand is a code for pushing Labour rightwards. What the party delivered, instead, was an incoherent mix. It stepped left on one issue only to step right again (on superannuation, for instance); it avoided political contest with the slogan ‘vote positive’ and mixed the worst of both rhetorical worlds with its promise to protect NZ Inc. Labour’s pains are deep and structural, and unlikely to be resolved by rotations at the top. What of the Greens? Being kept from government again spares them the test of power. But their contradictions develop. A pattern from the last election repeated itself, with the Greens doing well in wealthy areas and slipping away in poorer (and browner) communities. 11% for the Greens in Epsom; 12% in Ilam; 28% in Wellington Central against just 4% in Mangere and 3% in Manukau East. If ACT, the ‘nasty’ party of the New Zealand middle class is now a zombie force kept in undeath by National, the Greens, the ‘nice’ party of the same social base, exist in another half-world. They campaigned around inequality and child poverty, but not with or to those affected by this situation. Shedding, with each election, their association with the historical Left, the Greens face an uncertain future. Taking 10% of the vote, a small drop from the last election, and after months of hoping for much more, the Greens may be reaching an electoral plateau, the fate of so many Green parties internationally. One in ten votes may be the scope of socially liberal affluence. The Greens’ disappointments are nothing to the defeat of Internet Mana. Hone Harawira’s loss in Te Tai Tokerau is a bitter prospect for anyone on the side of workers and the poor. There is no comfort to be found here; Harawira, the MP arrested standing with state housing tenants, the veteran of the 1981 Springbok Tour protests, the 2004 Hikoi, decades of activism for Maori, is a symbol of resistance the political class will be overjoyed to see out of Parliament. Talk of the establishment ganging up on Harawira does not help us either. Labour threw everything they had at the Mana Movement in 2011, only for Kelvin Davis to lose (twice). An endorsement from John Key is of dubious value in the far North; similar noises in 2011 made little difference. An anti-establishment candidate should expect attacks from the ‘establishment.’ That is what made Harawira’s previous victories so electrifying. This time around voter participation fell by around 1500 votes from 2011, as did the Maori Party candidate’s vote. Opposing the alliance when it happened, we argued that a ‘sugar hit’ of this kind would not necessarily be fatal if it didn’t become a habit. This, it turns out, was massively to understate the damage of the kind of cross-class mixing the mash-up represented. All the Internet Party’s money and media exposure brought barely a lift, and the alliance with the Internet Party damaged Mana amongst its supporters in the poorest parts of the Maori world. Mana lost 1518 party votes in Te Tai Tokerau compared to 2011. The gimmicks the Internet Party represented, and the idea that money can buy political space for progressive ideas, stand exposed. Television coverage from different election night gatherings showed the differences in play: the downtown waterfront gathering of the Internet Party, with its tables laden with untouched expensive catering, was a social world away from Mana’s natural support bases. That tension – between a millionaire boss and his plaything party and a movement built up around the dispossessed and the marginalised – played out even before polls opened. In the end Mana suffered almost total marginalisation. Labour remains the dominant party in the Maori world. In the party vote, Mana was beaten into fourth place in Waiariki, behind New Zealand First and with under half of those who voted for Annette Sykes supporting Internet Mana. It came fifth in Tamaki Makaurau, beaten by the Greens and New Zealand First. Results in Te Tai Tonga, Ikaroa Rawhiti and Hauraki Waikato were similarly dire. The alliance was promoted as a ‘strategic’ gamble and a chance to break out of Mana’s electoral limitations. In the end it did neither, breaking Mana’s support in the Maori seats and leaving Internet Mana irrelevant in the general electorates. A line from the Gospel of Matthew can be applied to class politics: “No man can serve two masters: for either he will hate the one, and love the other; or else he will hold to the one, and despise the other.” We should treat the right’s xenophobic scare-mongering around Kim Dot Com with the contempt it deserves, but learn lessons of our own. A party created by a millionaire and setting itself up to serve the needs of the professionals of the ‘internet generation’ was holding to a different vision from working-class politics. There is no pleasure for us in recording this defeat. We were partisans of the Mana project from its inception, and campaigned for Internet Mana in these last weeks. But a clear-eyed assessment of our failures is essential for any future success. The chatter floating across social media at the moment about recounts and media bias serves only to put off that difficult reckoning. This analysis is provisional, and immediate, and bound to change as fuller results become available and the shape of the new coalition emerges. But we need to start with these bad new days, and not any good old ones. National and Key continue in a position of astonishing strength. Our side remains in disarray, with our unions weak, or social movements demoralised and the parties and organisations of the extra-parliamentary left smaller than they have been in generations. Our tasks, however, remain the same. The contradictions of New Zealand capitalism remains. The social crisis remains. What our class needs remains: organisation, ideas, politics. So resilience is important. We cannot afford politically to be demoralised. And nothing is inevitable or eternal. In 2004, just after John Howard won a fourth term in Australia it seemed as if he and his Liberals were invincible. Some columnists wrote about moving to New Zealand they were so depressed with the state of Australian politics. With three years his government had been defeated and Howard himself had lost his seat, broken by opposition to his industrial relations reform. Issues raised during the campaign – from the links dissected in Dirty Politics to the revelations on surveillance by Greenwald and Snowden – will not go away. Key may position himself as a centrist, but his announcement as priorities anti-union Employment Relations Act changes, education reform and pro-business and anti-environment alterations to the Resource Management Act show that he has real attacks planned. We should expect further divisions over the next three years in the life experiences of the wealthy and the poor. Class struggle will continue to be waged by their side. How will ours respond? This was a grim weekend, and there is plenty to feel sad and angry about from this election. The disjuncture between the scale of our task and the state of our forces can seem overwhelming. But there will be fights in the months and years ahead. And we have no choice but to defend our own class – no one else will do this for us. The need for clearly-argued socialist politics – and for independent working-class political organisation – has never been greater. That remains our project.